Metric Analysis: For as explosive and fast Obi Melifonwu is. There are numerous obstacles to projecting him as an All-Pro or even Pro Bowl safety. His age for one is below the threshold for All-Pro and Pro Bowl safeties. In addition to not hitting All-Pro or Pro Bowl level flexibility for his size. So, while Obi has a decent shot of becoming a long-term starter. Age and even a few production profiles are what separates Melifonwu from being Sean Taylor versus Gerald Sensabaugh. Metric Analysis: Josh Jones has an impressive starter profile. Elite explosiveness and speed. With above average production traits across the board. What he lacks is ideal age and has only average flexibility. I’d still project Jones as a long-term starter, but the Pro Bowl potential is less likely at strong or even free safety. Metric Analysis: Jabrill Peppers has a very interesting data profile. Elite explosiveness and speed. With elite solo tackle and pass deflection market share. But his interception market share is not Pro Bowl level. In addition to not performing the short shuttle or 3-Cone to determine flexibility. A common concern of many who watched Peppers’ film including myself. So, what do we have here? We have an explosive speed athlete who is solid at making tackles and forcing dead plays with his pass deflections. But may not have elite abilities to find and capitalize on the ball in the air. How he was used can also play a role here. However, I would say based on his profile and athletic abilities that are proven I would project as a long-term free safety starter with a slight chance to become a Pro Bowl outlier due to age. He is a unique player with a unique profile. But being unique is not necessarily a bad thing when you have some elite qualities. It just means that the sum of all his parts are more likely to disappoint if you don’t start with low expectations. Metric Analysis: Adoree Jackson has a solid long-term starter profile. Above average production and athleticism. He misses the mark on quality outcomes due to his low pass deflection market share. However, there is enough positives for him to be a starter. I’d project Jackson as backup to long-term starter only due to his pass deflection market share issues, but he could be one heck of a slot corner. Metric Analysis: Dupre has above average explosiveness. But his speed and flexibility are akin to Dwayne Jarrett. with less flexibility. He has good production and a great MSA rating. However, Dwayne Jarrett did too. So while there will be those who will value Dupre highly. I just can’t go there with his profile. I have posted multiple snippets on this subject, but I wanted to dive a bit deeper into the subject with recent posts on the matter. Quarterback is one of the positions where some believe data has no place in evaluation. Or at the very least data should be constrained to charting and game planning only. However, there is actually a lot to statistical data at quarterback. So before I go into my findings, I want to make it absolutely clear how I gathered the data, how far back I went and what I did to the data. First off, I gathered the data through college football reference and started off by gathering everything. Touchdowns, interceptions, yards per attempt and every other stat for quarterback. I went all the way back to 1958. In order to test the variables in different eras. 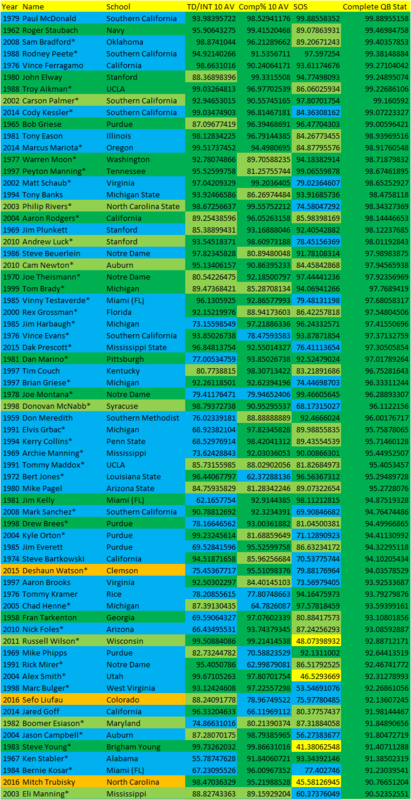 And the way I normalized the eras was by taking a 10 year college football sample for each quarterback. So a quarterback in 2016 was compared to every quarterback since 2007. While a quarterback in 1983 was compared to every quarterback since 1974. So on and so forth. This was the best way to compare eras, because what we are trying to figure out is how each quarterback performed relative to their era. Warren Moon’s stats today would look worse than Christian Hackenberg in 2015, but when compared to his era, he was a Peyton Manningesque performer. 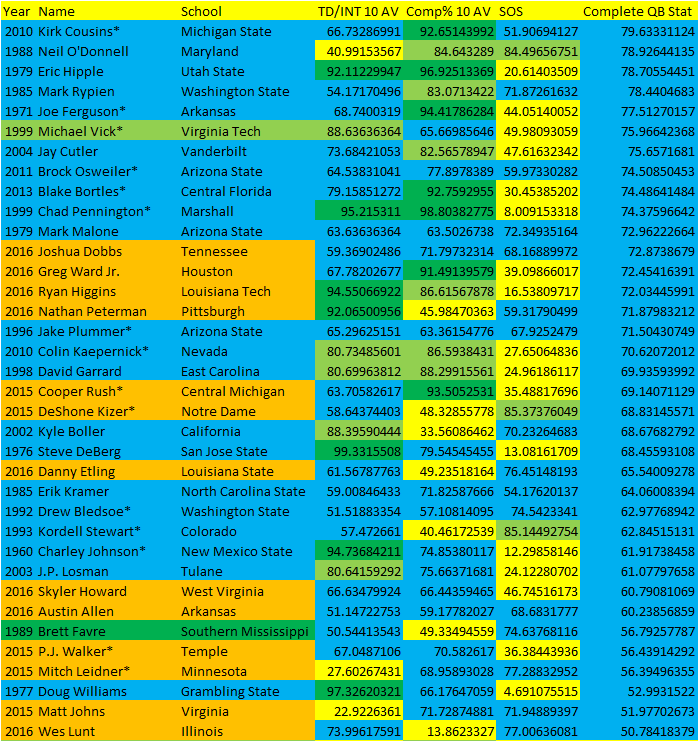 And the last point I added was strength of schedule data using college football reference. 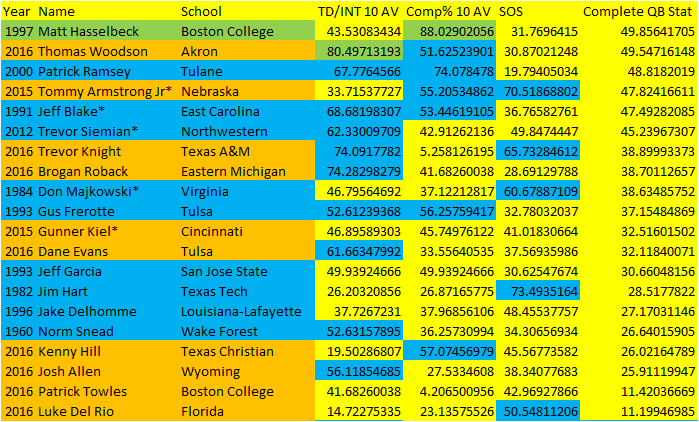 I added this layer in order to see if how well a quarterback performed schedule wise had impact to their stats. And it would normalize quarterbacks who played weak schedules versus quarterbacks who faced tough schedules in each era. The entire sample included 4,528 quarterback performances. After testing each variable, two variables stuck out the most correlation wise in TD/INT ratio and completion percentage. TD/INT ratio is taking into account how often a quarterback is scoring versus turning over the ball. While completion percentage speaks to a quarterback’s ability to minimize dead plays. After normalizing each quarterback performance with TD/INT ratio+completion percentage+SOS scores on a ten year sample for each performance. The results speak for themselves. 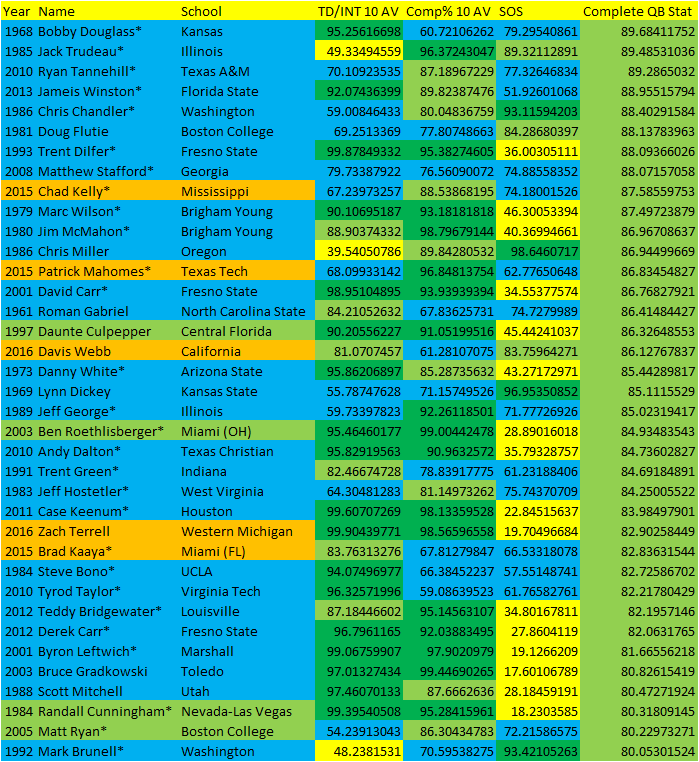 These were the quarterbacks who scored at least one 90 percentile or higher score in Complete QB Stat. The vast majority of multiple All-Pro quarterbacks since the 1958 NFL draft class scored a 91.40 or higher score in Total QB Stat. The vast majority of multiple Pro Bowl quarterbacks scored in the 80 percentile or higher of Total QB Stat. And surprisingly, or not so surprisingly Brett Favre was the only All-Pro quarterback since the 1958 NFL Draft Score to score lower than a 90 or 80 percentile score in Total QB Stat. Showing that the system isn’t perfect. However, it should be clear that quality quarterback score high end scores. While average starters typically score average or below average college scores. Matt Hasselbeck was the only multiple Pro Bowl quarterback to score lower than 50. But the question now is what to do with this data? Well it’s pretty simply like this. When projecting quarterbacks film, character profiles and age need to be examined in projection. But so does the Total QB stat. Not every quarterback who scores high in this metric will become highly impactful. However, the majority of All-Pro and Pro Bowl quarterbacks scored in the high end. Not every QB who scores high becomes a great quarterback. Very few quarterbacks who score low become good quarterbacks. But every great quarterback scored high. Not the mention the high school data that further helps to filter out the bad from the good. But that’s for another post. I hope explaining this data further can help you to understand it better. This is a very useful piece of data that is more correlative than any quarterback stat data out there. I don’t have a fancy acronym for it, because I don’t need one. Metric Analysis: Jourdan Lewis has a strong long-term starter profile. Above average production and flexibility. He lacks the length, speed, and flexibility to be an elite cornerback. However, he has a solid profile as a zone or slot cornerback. Thus, I’d project as a backup to long-term starter based on his production and flexibility traits. Metric Analysis: Xavier Coleman has some impressive athleticism traits. But a lot of unknowns exist in length, hand size and production from the FCS. He has the ideal athleticism for a zone scheme. Where his explosiveness and flexibility can aid in tackling plus getting downhill quickly. But he doesn’t have the speed to ever be an amazing man corner. Thus, I’d project as a backup to long-term starter in a zone/press scheme only. Yes Pro Bowl Explosive Lower Body Strength Score: 51 or higher 90% of multiple Pro Bowl DTs since the 1998 NFL Draft Class had an explosive lower body strength score of 51 or higher. Yes Starter Explosive Lower Body Strength Score: 4.64 100% of 64 start or more DTs since the 1996 NFL Draft Class had an explosive lower body strength score of 4.64 or higher. Metric Analysis: Tueni Lupeamanu has an impressive long-term starter profile. He has above average production and athleticism traits. What he lacks in height can throw the NFL off a bit. However, if he’s given an opportunity, he could be an impressive 3-Tech. Thus, I’d project as a backup to long-term starter with a decent chance of becoming a Pro Bowl like outlier if he’s given the opportunity. Metric Analysis: Elijah Lee has a solid long-term starter profile. Above average athleticism and production. He’s biggest issues are lacking elite or even near elite speed and flexibility for his size. His numbers would have been more impressive if he was 240 pounds, but he was 229. Thus I’d only value Lee as a backup to long-term starter only.